What was known? Hereditary angioedema is a genetic disorder due to a deficiency or malfunction of C1 esterase inhibitor. Hereditary angioedema (HAE) is an autosomal dominant disorder of C1 inhibitor (C1-INH) deficiency manifested by painless, nonpruritic, and nonpitting swelling of the skin. Type I HAE is defined by low plasma levels of a normal C1-INH protein. Type II HAE is characterized by the presence of normal or elevated levels of a dysfunctional C1-INH. Type III HAE has been recently identified as an estrogen-dependent inherited form of angioedema occurring mainly in women with normal functional and quantitative levels of C1-INH. We report the case of HAE (type 1) who responded well to stanozolol. 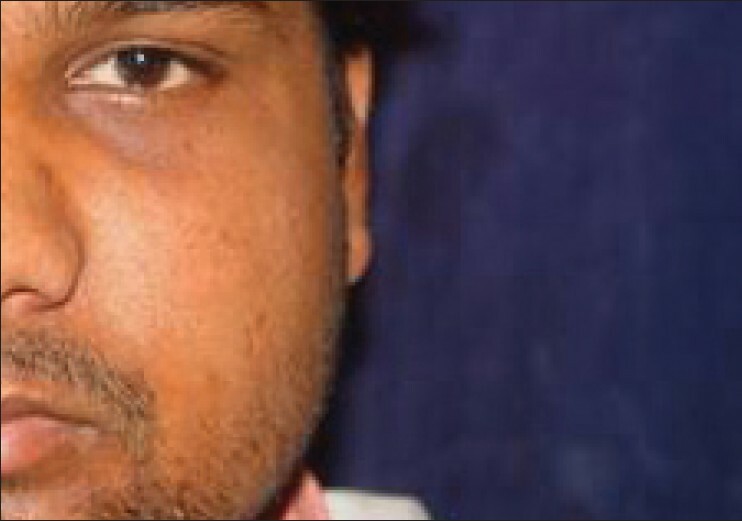 A 25-year-old male presented with swelling over face since one day. There were similar episodes since two years with gradual subsidence of swelling without any treatment. Patient also gave the history of minor trauma prior to each episode. However; there was no history of wheals, associated systemic complaints, drug intake, food allergy, and similar complaints in family. On cutaneous examination, there was edema of eyelids, left cheek, and lips. Based on the cutaneous finding, angioneurotic edema was suspected and patient was treated in emergency department with inj. hydrocortisone, inj. epinephrine, and inj. chlorpheniramine without any significant outcome. Swelling gradually subsided over a period of three days [Figure 1] and [Figure 2]. Laboratory investigations including complete blood count, liver and renal function tests, urine examination, antinuclear antibody test, chest X-ray, and X-ray of paranasal sinuses were all within normal limit. Considering the history of repeated episodes of angioedema without wheals without any precipitating factor with no response to usual line of management special investigations like complement C4 and C1 esterase inhibitor levels were done. Complement C4 and C1 esterase inhibitor levels were 1.44 mg /dl (N 10 -40 mg/dl) and 38 mg /L (N 275 - 400 mg/L), respectively, suggested the diagnosis of HAE (type 1). C1q level was not done because of unavailability of the test in India. Patient was started on stanozolol 2 mg thrice a day with no recurrence in one year of follow-up. HAE (inherited C1 inhibitor deficiency), also known as Quincke's edema, was originally described and named by Osler in 1888. This is a rare disorder, accounting for only 5% of all cases of angioedema without wheals and only about 1% of all cases of angioedema. It is transmitted as an autosomal dominant trait on chromosome 11. A family history is usually, but not invariably apparent. Over 50% of cases present before puberty,  but the onset may be delayed even into late adult life. Acquired C1 inhibitor deficiency (acquired angioedema AAE) is a rare disease that occurs in two forms, AAE 1 and AAE 2. AAE 1 is associated with malignancy (B - cell lineage, breast cancer, etc); AAE 2 is an autoimmune disorder and has C1-INH auto antibodies. There is a lack of evidence of inheritance and the onset of symptoms is in middle age. C1q levels are normal in HAE and depressed in AAE. The response of HAE to conventional treatment for allergy associated angioedema is generally poor. Antihistamines, steroids, and even epinephrine are said to be of little or no use. Treatment may be considered as long prophylaxis, short term prophylaxis, and the emergency management of an established attack. Estrogen therapies, such as oral contraceptive pills, may induce or exacerbate HAE and should be avoided if possible. 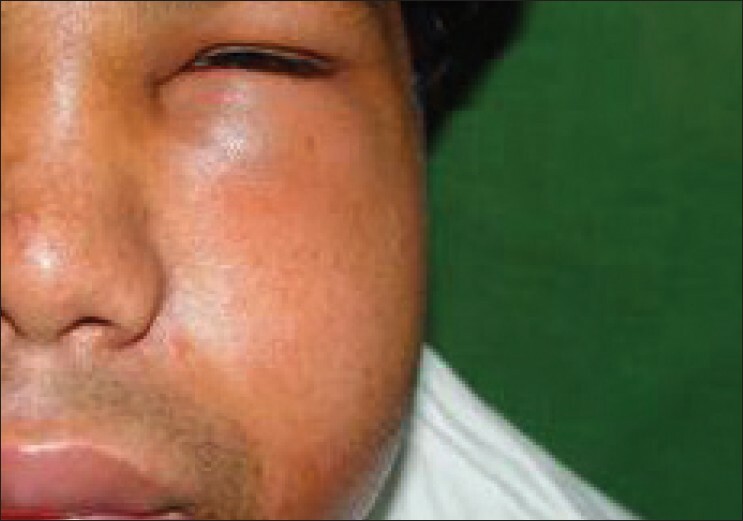 In clinical practice, generally, angioedema is considered allergic in origin, but HAE is familial condition characterized by deficiency of C1 esterase inhibitor. As this is a fatal condition, proper diagnosis is a must as treatment differ from usual treatment of angioedema. One must do C4 level as a screening test and C1esterase level as a definitive test once the angioedema without associated urticaria is encountered. 1. Agostony A, Cicardi M. Hereditary and acquired C1 inhibitor deficiency: Biological and clinical characteristic in 235 patients. Medicine 1992;71:206-15. 2. Williamson DM. Reticulate erythema: A prodrome in hereditary angioedema. Br J Dermatol 1979;101:549-52. 3. Donaldson VH, Evans RR. A biochemical abnormality in hereditary angioedema. Am J Med 1963;35:37-44. 4. Bork K, Barrnstedt SE, Koch P, Traup H. Hereditary angioedema with normal C1 inhibitor activity in women. Lancet 2000;356:213-7. 5. Brickman CM, Tsokos GC, Balow JE, Lawley TJ, Santaella M, Hammer CH, et al. Immunoregulatory disorders associated with hereditary angioedema, 1: Clinical manifestations of autoimmune disease. J Allergy Clin Immunol 1986;77:749-57. 6. Bork K, Witzke G. Long term prophylaxis with C1-Inhibitor concentrate in a patients with recurrent angioedema caused by hereditary and acquired C1 inhibitor deficiency. J Allergy Clin Immunol 1989;83:677-82. What is new? In spite of resemblance this condition is not an allergic disorder.